Obama taking a hard line with Benjamin Netanyahu: What does the president want from the Israeli prime minister? What Does Obama Want From Netanyahu? If the Israeli prime minister wants to make nice, here’s what he’ll have to do. 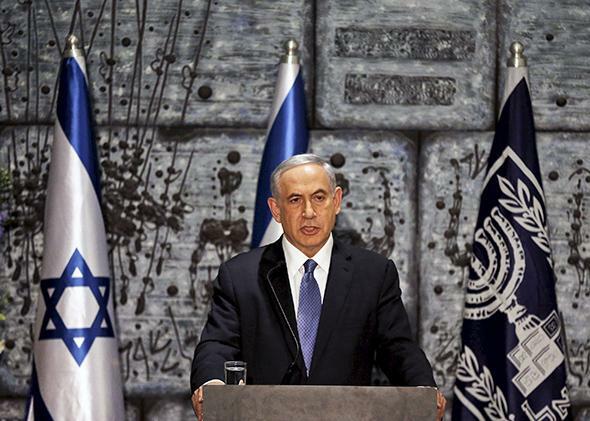 Israeli Prime Minister Benjamin Netanyahu speaks during a ceremony at President Reuven Rivlin’s residence in Jerusalem, March 25, 2015. Why is Obama taking such a hard line? What is he trying to accomplish? What does he want from Israel? The administration hasn’t answered those questions. But in the last few days, its posture has changed. A week ago, just after the election, Obama’s aides portrayed Netanyahu’s position on Palestinian statehood as unclear. They argued that the prime minister had said one thing before the election and another thing after the election. Therefore, nobody knew what he really believed. This week, the administration has sharpened its critique. The new public assessment is that Netanyahu’s election-eve dismissal of Palestinian statehood is genuine, because it matches other statements he made at the same time. First, just before confirming that under his rule “a Palestinian state will not be established,” he explained why: “Anyone who is going to establish a Palestinian state today and evacuate lands is giving attack grounds to the radical Islam against the state of Israel.” Netanyahu argued that a Palestinian state could not be accepted as long as ISIS, Iran, and other militant threats made such a state a possible staging ground for violence. By linking its hard line against Israel to these two statements, the Obama administration is sending Netanyahu a message that he must rethink both policies. He must halt the offending settlements. And he must withdraw his demand that Middle Eastern stability precede Israel’s acceptance of Palestinian statehood. The conventional view of the current U.S.-Israel standoff is that the Obama administration unloaded on Netanyahu immediately after his victory. But that account doesn’t quite match the record. For several days, as Netanyahu scrambled to rephrase his views, administration spokesmen expressed agnosticism. When reporters pointed to Netanyahu’s post-election revisions and asked why Obama didn’t take the prime minister “at his word,” White House Press Secretary Josh Earnest retorted: “Which one?” Earnest argued that “even the divergent comments of the prime minister legitimately call into question his commitment.” In an interview on Friday with the Huffington Post, Obama said he was re-evaluating U.S. policy because of Netanyahu’s dismissal of Palestinian statehood before the election. The president didn’t address Netanyahu’s post-election backpedaling and didn’t explain why it shouldn’t be believed. After the election, the prime minister said that he had not changed his position. But for many in Israel and in the international community, such contradictory comments call into question his commitment to a two-state solution, as did his suggestion that the construction of settlements has a strategic purpose of dividing Palestinian communities and his claim that conditions in the larger Middle East must be more stable before a Palestinian state can be established. We cannot simply pretend that those comments were never made, or that they don’t raise questions about the prime minister’s commitment to achieving peace through direct negotiations. McDonough’s speech cut through the agnosticism. In his analysis, Netanyahu’s election-eve rejection of statehood wasn’t just a superficial gesture to the Israeli right. It matched the prime minister’s remarks about Har Homa and creating a staging ground for Islamic radicals. Each statement—no state on my watch, any state would be a military threat, settlements divide the West Bank—reinforced the others. The portrait cohered. This was the real Netanyahu. Afterwards, he pointed out that he didn’t say “never,” but that there would be a series of conditions in which a Palestinian state could potentially be created. But, of course, the conditions were such that they would be impossible to meet anytime soon. So even if you accepted, I think, the corrective of Prime Minister Netanyahu in subsequent days, there still does not appear to be a prospect of a meaningful framework established that would lead to a Palestinian state.